People that know me know that I love desserts - especially desserts with fruit of some kind! I've been playing around with individual desserts lately (individual self-saucing caramel puddings coming soon!). 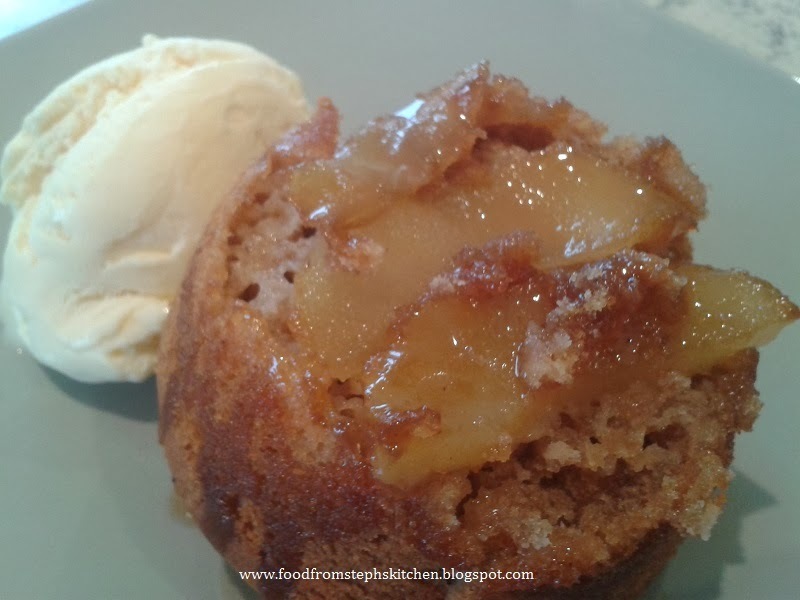 A couple of weeks ago I tried a new recipe: Apple and Maple Syrup cakes. This was a recipe that I was going to post later in the year, but when I posted the pic on Facebook I had so many of you request the recipe. So I had to move it up in my calendar! Now for those thinking 'I'm not much of a maple syrup fan!' it's ok - you only use a little bit of maple syrup while it bakes, and then later you can just drizzle as much as you'd like over the top. Mr Steph is the same and isn't a massive fan of maple syrup. One thing to remember with maple syrup is that it is better to spend that little bit more and get a good quality one. I always buy a Canadian maple syrup but you don't have to. 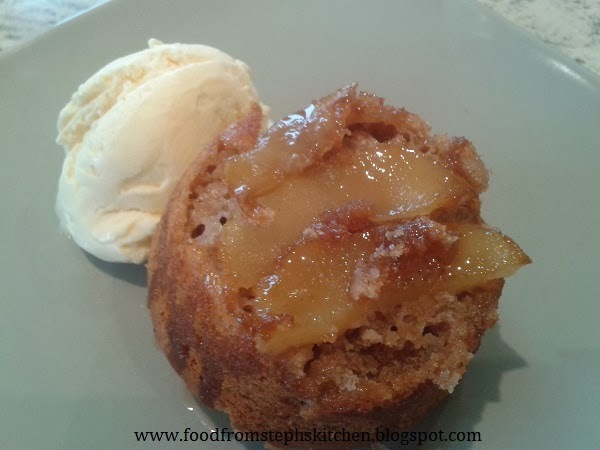 Just like an apple tea cake, where the sugar on the bottom makes a lovely almost caramel crust, the maple syrup cooks the apple and creates a little bit of a sticky "top". You layer your cakes just like an apple tea cake too, placing the apple on the bottom first followed by the syrup and then the batter. Alternatively, it will make approx 8 normal sized muffins. The batter is made just like any other cake. You'll need your mix master or electric beaters, or if you don't have either you can simply use a wooden spoon - it just takes a little bit more work, and you might not get your margarine quite as fluffy. I often use a wooden spoon and it's fine. Before you go any further - turn on your fan forced oven to 170 C or 340 F.
Cream your margarine or spread until fluffy, then add your sugar and beat again for a couple of minutes. Next is your egg and vanilla extract. Add them to your butter and sugar mixture and beat until well combined. We want to alternate adding the flour and milk. Add 1/2 cup of flour at a time to your mixture, beating it into the mixture before adding a little bit of your milk. Continue this until your flour and milk has all been added. Now that's your batter done; let's get started on making the base of the cakes. Peel and core your apple, slicing half of it into thin-ish pieces and the other half into small cubes. 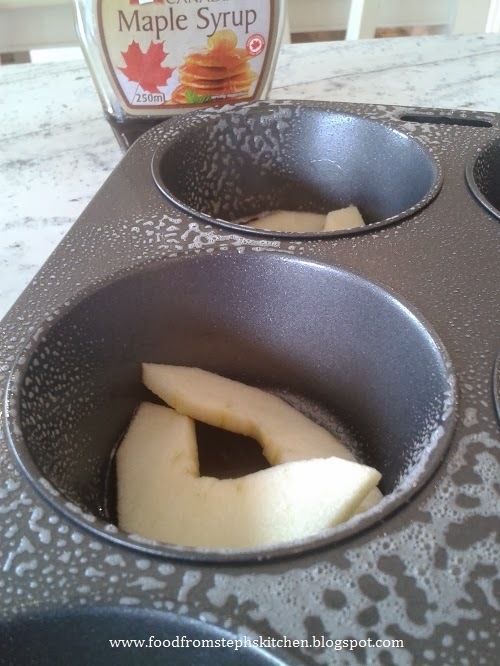 Add the cubes into your batter, mixing it through so that you won't have one muffin with apple and then none in the others when you start scooping your mixture later. Next grease your muffin tray or spray it with oil. Put two or three slices of apple on the bottom of each cup, trying to create the one layer without too much overlapping. Drizzle a teaspoon of maple syrup in each cup, followed by scoops of your batter. You want to try not to fill the cups past 3/4 full. I try to aim for a little over half. If you have more mixture, then you can add more. It will just mean that you have bigger muffins. 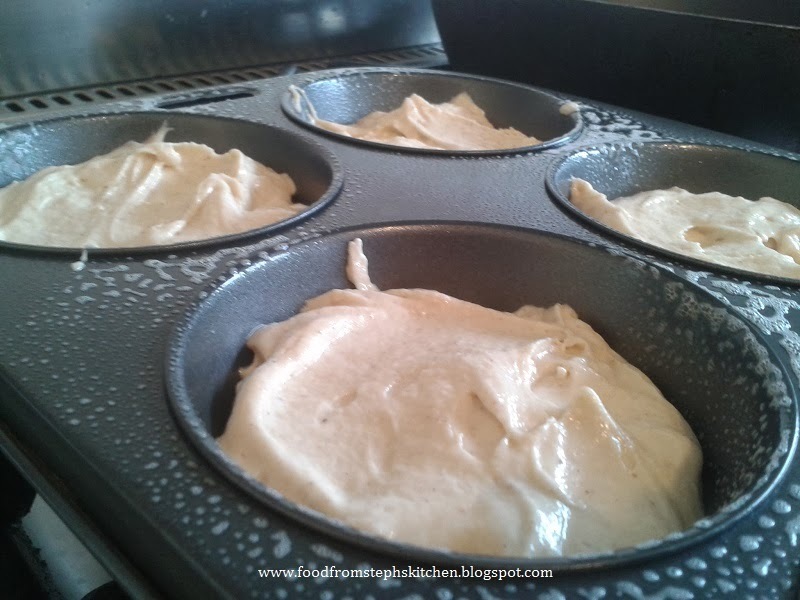 Once you've constructed your muffins pop them in the oven for 25 - 35 mins until your cakes are cooked through. Drizzle with a little bit more maple syrup before serving with custard, cream or ice cream - or a bit of them all! Thanks Laura! They are such a great little dessert. We love them with ice cream and sometimes also a little custard. I hope you enjoy them as much as we do!